A woman is recovering after she was bitten by a shark while on vacation in the Bahamas. NBC 6's Laura Rodriguez reports. A Massachusetts woman has been released from a South Florida hospital after suffering a shark bite in the Bahamas on Sunday. 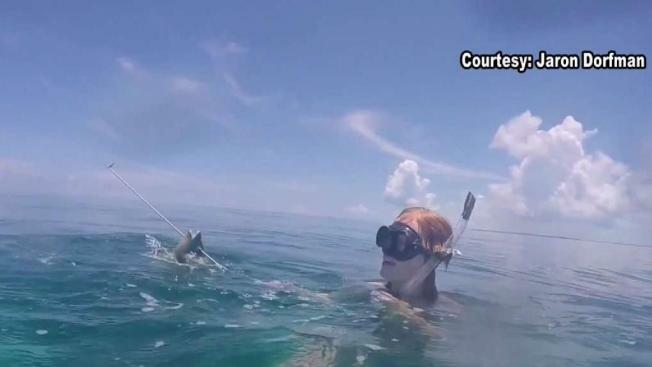 Maggie Ewing, 34, was spearfishing off Treasure Cay Coast when the shark went after a fish on her spear and inadvertently bit her hand, according to Abaco Fire Chief Colin Albury. Officials said the woman was in shock and severe pain. Ewing was airlifted to Memorial Regional Hospital in Hollywood, Florida by Trinity Air Ambulance. She spoke about her ordeal with reporters at the hospital on Tuesday afternoon. Ewing, who is from the Boston area but has a vacation home in the Bahamas, said she was spearfishing with her boyfriend in an area they had been to hundreds of times before. She had speared a hogfish and was trying to get it out of a small cave when the shark came over her shoulder and latched onto her hand. 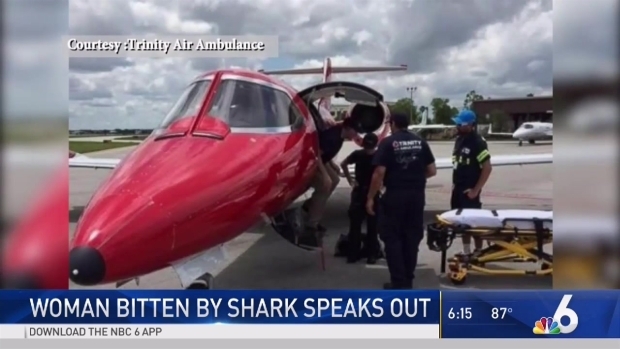 A Massachusetts woman is recovering at a South Florida hospital after she suffered a shark bite in the Bahamas on Sunday. NBC 6's Stephanie Bertini reports. "I felt the pain instantly," Ewing said. "I think he let go pretty quickly, probably felt the spear." "I know sharks aren't really going for me, he was totally going for the fish," she added. "It was my mistake, but nonetheless, he got me." Several of her fingers were badly injured in the attack, but doctors said they were able to save them. She was released from the hospital late Tuesday and said she is planning to return to the Bahamas. Shark attacks in the Bahamas aren't a common occurrence, but they have been known to happen, according to Albury.